Invalidovna is located near the Vltava river in an area called Karlín, by the Sokolovská street. It is named after a building in the vicinity, which is a former house for the war invalids. 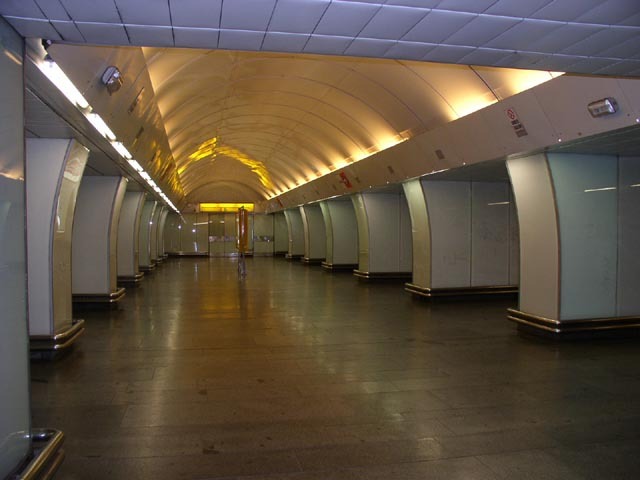 The station was opened in 1990 and ranks among the less busy stations of Prague metro. It serves a small neigbourhood of panel houses. 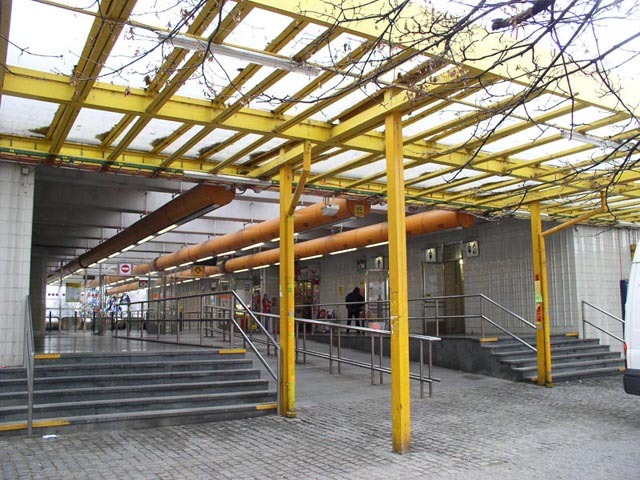 There's also a tram stop next to the metro station. 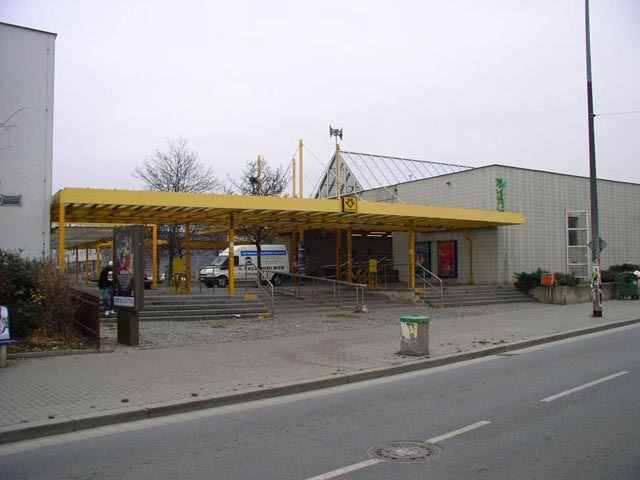 A view of the station from the Sokolovská street. 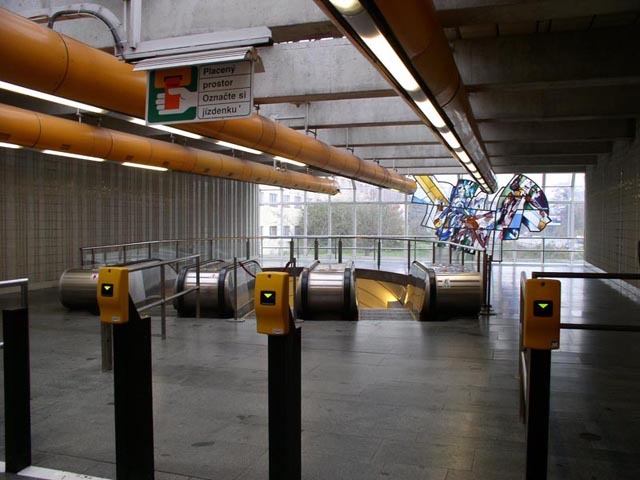 The ticket hall is directly accessible from outside, as you can see. 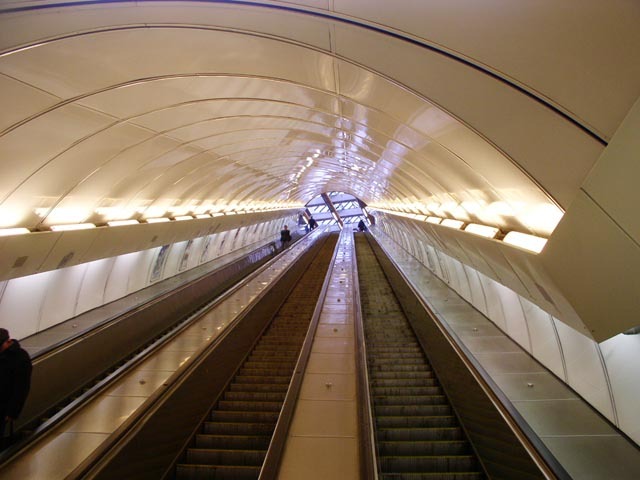 An interesting thing is that you have to go up the six stairs (or walk up the ramp) before you can go down to the station. The inner part of the ticket hall with the escalator shaft down to the platform level. A detailed view of the artwork you could see on the previous picture. I have no idea what does it picture. There are probably some sportsmen, which is quite ridiculous when you compare it with the name of the station. But maybe the reason is that there were plans to build a large sports facility in this area, on the banks of the river, maybe even for the Olympic Games, because Prague aspired to hold them. However, this plans were never realized. 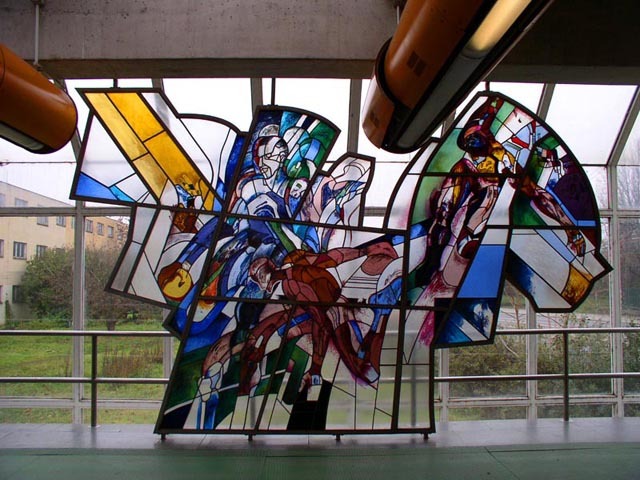 There are still some intentions among the city council towards the Olympics, but it is now obvious that should the Games ever be in Prague, the main facility would not be here. Because as we have senn in 2002, the banks of the river are in danger of flooding. The escalator shaft, looking up from the platform level. 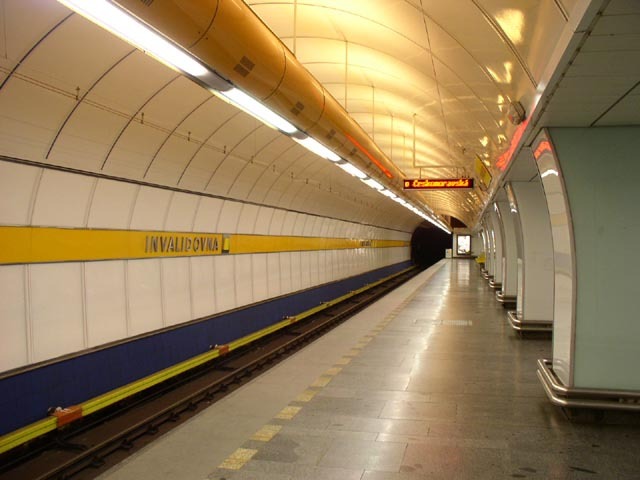 With the depth of 20 metres, Invalidovna is one of the shallowest bored stations in Prague metro system. 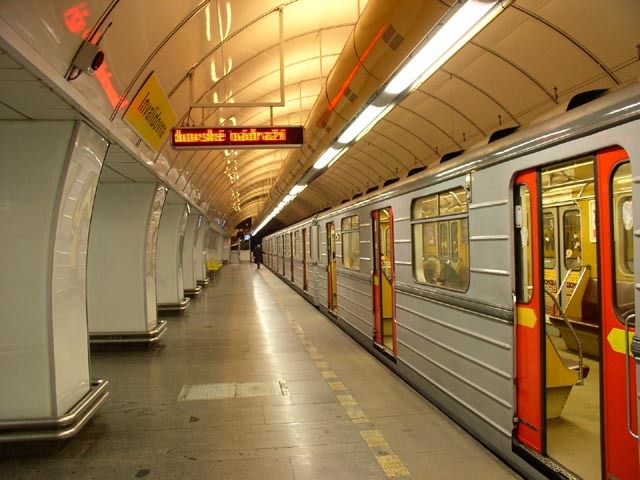 It is similar deep as Vltavská on line C, which has been built using the cut-and-cover method. The ceiling in front is in fact not as blue as it looks on this photo. It is probably due to the flash of my camera. A view of the eastbound platform, looking west. And the other end of the eastbound platform. 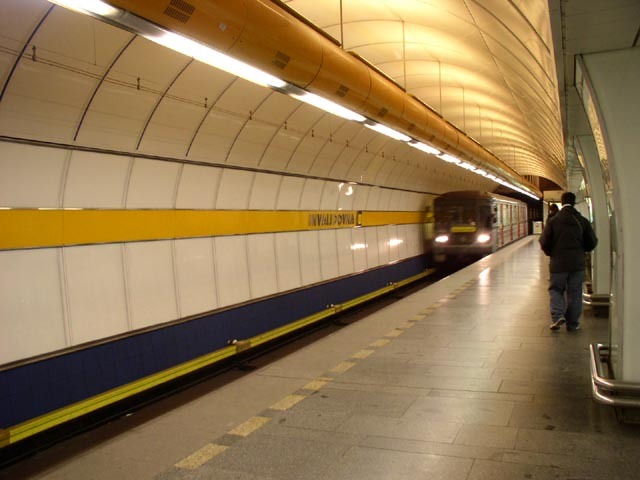 The westbound platform, with a train arriving from Palmovka. The westbound train has just stopped at Invalidovna and the doors are opening. 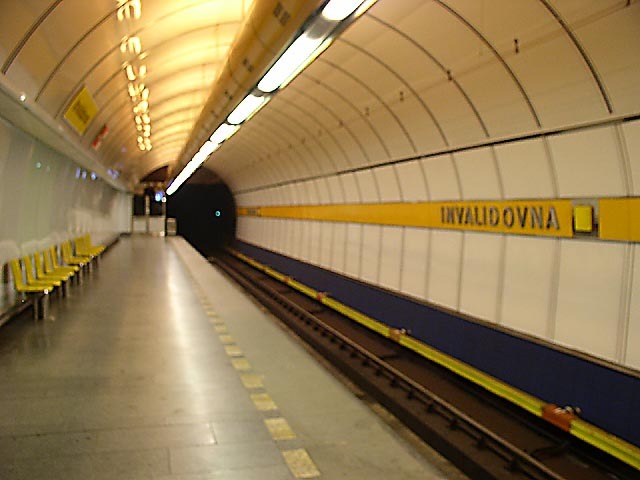 The display above is saying that this train terminates at Smíchovské nádraí. Prague tourist info - Prague-wiki.com - online encyclopedia of Prague; best source of tourist information about Prague: Old Town - Staré Město, Lesser Town - Malá Strana, Castle District - Hradčany, New Town - Nové Město. Church of Our Lady Victorious, Church of Our Lady before Týn, Strahov Monastery, Charles Bridge.